Alejandro González studied photography by attending courses with the celebrated photographers Diego Goldberg (Workshop on Photojournalism, 1996), Luis González Palma (Workshop on Photographic Manipulation, 1997), Edgar Moreno (Workshop on Photographic Manipulation, 1999), and José M. Mellado (Workshop on High Quality Digital Photography, 2008). Gonzalez went on to attend residencies at the Cologne Academy of Media Arts in Germany (2006) and the Batiscafo Project in Havana (2002). He was awarded the Casa de las Américas Prize for Photography in Havana, 2009. 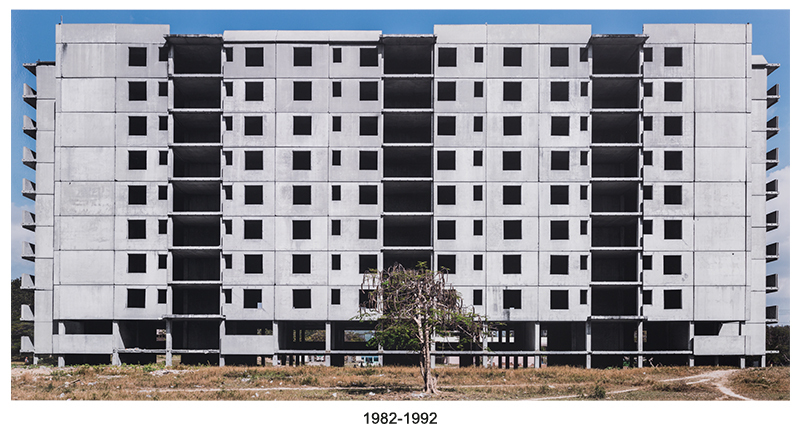 His solo show include Historias Diferidas (Differed Stories) in 2013 and Conducta Impropia (Improper Conduct) in 2008, both at Servando Gallery in Havana; 9 Fotos at the Cuban Photographic Library in Havana, 2006; Memorias del subsuelo II (Subsoil Memories II) at Habana Gallery in Havana, 2004; and Blackout at the Museum of the City of Torreón in Coahuila, México, 2000. His works are part of the collections of the Museum of Latin American Art (MOLAA) in Long Beach, California; the Lehigh University Art Galleries in Bethlehem, Pennsylvania; and Casa de las Américas in Havana. 1979-1992, de la serie Re-construcción, The Mega Projects (1979-1992, from the series Re-Construction, The Mega-Projects), 2014. Inkjet print and text, 53 1/8 x 69 1/2 in. Ed. 1/3. 1982-1992, de la serie Re-construcción, The Mega Projects (1982-1992, from the series Re-Construction, The Mega-Projects), 2014. Inkjet print and text, 39 5/16 x 75 5/16 in. Ed. 1/3.